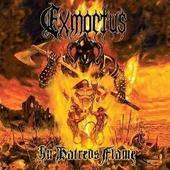 Exmortus are guitar-driven and I mean that literally: the guitar is the song. It's fast, melodic and whip smart. The solos are blisteringly fast and, with songs titled "Kneel Before the Steel" and "Crawling Chaos," you can bet they don't sing about fuzzy bunnies! The guitar is neo-classical; you'll either step up your playing or break your axe over a chair and toss it in the trash after listening to this disc. Conan the guitar player leaves no string unbent and prevails when it comes to laying down solos that would make the most novice players take note. 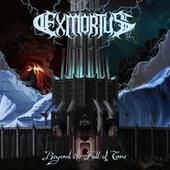 Exmortus are thrash but have a neo-classical guitar as their forefront. The vocals are hardy and in-your-face, the drums gallop along and keep time with the guitar. If you want something that will make your life move 100 mph, then pick up "Beyond the Fall"! To find out more check out http://www.facebook.com/exmortusoffical or http://www.myspace.com/exmortus. With their blend of riff-heavy thrash, neo-classical folk metal and a healthy dose of technical death metal, one may think upon first listen that Exmortus is another great act to appear from the Nordic culture and not from Whittier, California. The album, from beginning to end, is a technically brutal and frantically fast masterpiece. The first song to unleash this album is the title track, "In Hatred's Flame," which is a nice showcase for the band's abilities; it's heavy with amazing riffs and exhibitions of the band's talent. The mid-paced thrasher "War Gods" gets the blood pumping, with intense drumming and beautiful riff progression. By this time, just three songs into the album, you can really see that Exmortus are all masters of their instruments, with sweeping guitar solos and complex drum patterns that all makes your jaw drop at all time. "Valor and Might" is an excellent example of the band's Folk tendencies as a nice medieval bass intro starts it out, and the melody is truly epic. Next up we have a demonstration of the guitarist's ability with "Aces of War." Sounding damn near as good as the best of guitar players, this song gives a nice little break from the brutality of the other songs but leaves you craving the onslaught yet to come. Head-banging mayhem is delivered right from the first note of "Glory of the Battlefield." Picking up the pace set by the previous song, "Onslaught" will have you screaming the lyrics alongside the album with the bloodlust of battle. "Wreath of Vengeance" could be a marching song for a barbarian army. Drudging and epic at first, it turns into a chaotic riff fest. Closing the album is "Fimbulwinter," a perfect summary of the entire album: brutal, fast and talented. "In Hatred's Flame" is on of the best releases of 2008 and while it does blend together a little at times, it should not be looked over by any extreme metal fan. For more information, check out http://www.myspace.com/exmortus. Copyright � 2012 by R. Scott Bolton. All rights reserved.